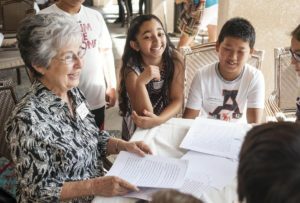 The resident of the Morningside of Fullerton retirement community sat at the head of a table talking about growing up during the Great Depression – hoping for just one Christmas present, a pair of roller skates – and the following war years for four Laguna Road Elementary fifth-graders who know nothing of either except what they’ve read in their textbooks. Rice’s story and others recorded Friday by the tech-savvy students will be produced into digital biographies as part of the Fullerton School District’s new Story Angels program. The students are using Adobe Spark to edit the footage with old photographs. In November, the children will return to Morningside for a screening of the completed multimedia projects. The school has 100 students participating, grouped in quartets with residents of the retirement community. “There’s a lot of joy, a lot of enrichment, and not only for the children, but for our seniors,” said Diana Blidy, Morningside community life and services director. “They love seeing the look on the children’s faces when they tell their story and when the children say it back. The students previously interviewed their seniors, taking notes and writing biographies in class. Let her group tell it, and Patsy Zima slept in a barn with her pet goat. She set the record straight when her interviewers returned to Morningside on Friday with follow-up questions. Vi Barrett, 87, told her group about being the first female radio dispatcher in Los Angeles’ FBI office. She showed the students a photo of herself taken in the 1940s, sitting at her desk with a typewriter in the background, a gooseneck microphone and a rotary telephone. “I want these kids to realize they can go apply for anything that they think they can have fun doing,” she said. Virginia White, 86, walked into the Catalina Club at Morningside with four students prepared to record her story. The students set up their iPads to capture her from different angles as she read about a trip she and her son took to the Colorado rapids 41 years ago. “Bye, bye, Ms. White,” one fifth-grader said after filming. Sophia Lopez, 10, was one of the students who interviewed Rice. Harder than recording and editing a digital biography, Sophia said, was coming up with questions and writing a script to be read on camera.